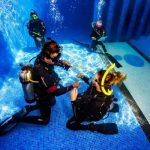 The PADI Open Water Diver course is a complete, carefully structured entry level scuba diving course designed to take you from a non-diver with little or no prior experience to a certified diver. The certification is recognized worldwide and is valid for life, to a maximum depth of 18 meters / 60 feet. The fun part about this course is . . . well, just about all of it because learning to dive is incredible. 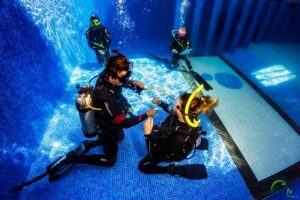 During the course, you’ll make at least five pool dives and four dives in the ocean under the supervision of your PADI Instructor. Be at least 10 years old for Junior Open Water Diver course and at least 15 years old for Open Water Diver course. PADI eLearning requires a minimum age of 13 years due to international internet laws. Theory: The theory portion of the open water course includes book work, videos, study questions, and quizzes. The 5 dive theory modules cover a range of topics such as pressure-depth relationships, the underwater environment, dive planning, and equipment. Pool Work: During pool (or “confined water”) classes, students practice basic diving skills in the pool. Divers practice all the skills that they use on open water dives like ear equalization and mask removal and replacement in this controlled environment before entering the open water. Open Water Dives: Under the watchful eye of an instructor, you will apply the knowledge and skills learned in the theory and pool sections of the course on real open water dives. Choose the eLearning option and study from home. You will start directly with the pool and the next day you will be a certified diver! PADI offers a variety of home-study materials for the Open Water Diver course. You can study when and wherever you want and arrive to our diving center ready to start the training. Dive the Mayan Cenotes, unique and incredible caverns, with only your Open Water Diver certification. Padi Open Water Diver manual and table.